If we don't take care of the customer, maybe they'll stop bugging us. Need to contact tech support at Facebook? It's a challenge to connect to the right customer service person — you can waste hours circling through a maze of self-help prompts and navigating 150+ contact forms. Or... instead you can use the list of How to Contact Facebook, LinkedIn, Twitter, and Other Social Networks compiled by Kristi Hines. Kristi provides links to contact support staff for Facebook, Pinterest, Twitter, LinkedIn, Google+, Instagram, StumbleUpon and Reddit. You might want to set a bookmark for How to Contact Facebook, LinkedIn, Twitter, and Other Social Networks so you have access to the right form if ever you need it. 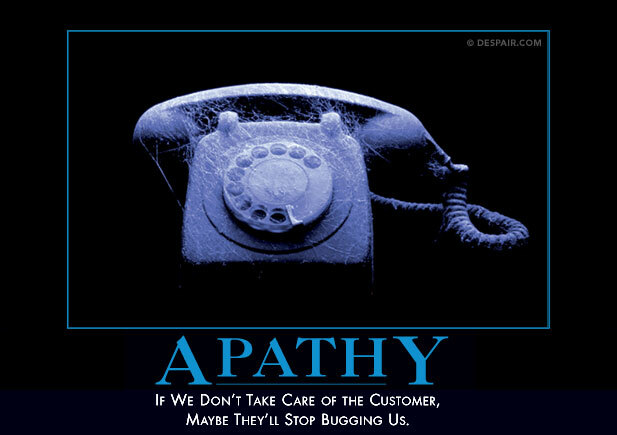 Image credit: "Apathy: If we don't take care of the customer, maybe they'll stop bugging us." from Demotivators.